Centurion Nova Prime Rhomann Dey approaches Earth in his pursuit of Zorr, the alien who destroyed Dey's homeworld of Xandar. Fatally injured, Dey randomly passes his Nova Force powers to 17 year old Richard Rider who becomes the super-hero known as Nova. Nova establishes his own rogues gallery of villains including the Condor, Diamondhead, Powerhouse, Blackout and his arch-enemy the Sphinx. After a number of months of fighting crime on Earth, Nova goes to Xandar and leads the New Champions into battle against the Skrull in the Skrull/Xandar War. Nova leads a mission to Epyrus 7 where Diamondhead betrays the Nova Corps and fights for the Skrull until he also betrays them. Nova unleashes a full Gravimetric Pulse which kills the dying aliens of both races who have been exposed to a lethal bio-agent. The event traumatizes Rich and the Xandarians suppress Nova and Diamondhead's memories of the mission. Nova and the New Champions along with the armored alien Rom, fight off the final invasion attempt by the Skrull and Diamondhead leading to the Skrulls' surrender. In order to return home to his family on Earth, Nova must give up his Nova powers so they can be used to protect Xandar. Rich Rider goes to Dr. Reed Richards of the Fantastic Four to see if he can help him regain his powers. After a series of tests, Richards discovers Rider's access to the Nova Force has been suppressed to such a level that he only has a 35% chance of ever regaining his powers. Rich Rider spends almost the next two years bouncing from job to job and almost all of his free time working out in Gold's Gym. Meanwhile, the domed worlds of Xandar are attacked by the space pirate Nebula in the stolen Sanctuary II, a powerful starship belonging to the mad Titan, Thanos. Nova's former allies, the New Champions (now named the Champions of Xandar), are killed in the attack. During the attack, Xandar's Queen Adora and the Prime Thoran Thoral Rul channel almost all of the power of the Nova Force into a Xandarian named Garthan Saal. Saal goes insane from the power and his desire for revenge and becomes the super-villain named SuperNova. Unknown to Rich Rider, Adora also reactivates Rich's access to the Nova Force. Adora feels Rich Rider respresents the true spirit of Xandar and, when combined with Saal's energy, the two of them will be able to restore Xandar. The hero known as Night Thrasher hacks the computers of the elite spy organization SHIELD and steals the file Dr. Richards had created on Rich Rider and shared with SHIELD. 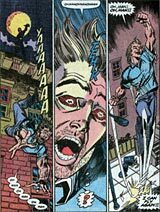 Rich Rider is grabbed by Night Thrasher and dropped from the top of a building. Thrasher guessed that a life-threatening situation might be enough to reactive the Nova Matrix inside Rich's body. Whether it was the situation or the return of Rich's Nova powers by Adora occurring at the same instant is unknown. In return for restoring his powers, Nova agrees to help Night Thrasher form a new super-hero group, the New Warriors. The media nicknames him 'Kid Nova' as he is not wearing the same costume he was when he was Nova. Nova participates in numerous adventures both with the New Warriors and on his own. They include saving the Earth from the Lady Sphinx after she had altered the planet to be ruled by her and the Sphinx. After the Earth was returned to normal, Night Thrasher gives Nova a new costume very similar to the one he wore when he was first Nova. Soon after, Rich participates in the various Infinity Affairs involving the Infinity Gems, Thanos, Warlock and other cosmic beings. He also teams up with Spider-Man on various threats including the Tri-Sentinel, the Sphinx and Midnight and the Secret Empire. Nova becomes involved in the StarLost Saga as Queen Adora's plan to resurrect Xandar begins. SuperNova returns from the timestream to find Rich Rider's powers have been reactivated. During the course of their battle, the two merge into a single energy being with Rich's mind in control. Rich Rider channels all the Nova Force into the WorldMind and the Nova Corps is reborn. In gratitude, the Xandarians boost Rich's power levels considerably. Some time later, Nova meets Novas from alternate universes. These more experienced Novas (Nova 0:0 and a Nova who never gave up his powers after the Skrull/ Xandar War) help train Rich to better use his powers. Nova continues his membership in the original and reformed versions of the New Warriors. Rich also decides to attend college at Empire State University where he majors in Film Studies. Rich Rider continues his college studies. Teaming up with a number of other super-heroes, Nova helps fight the Titannus War and helps save the world from a powerful, genetically-altered Skrull. During a summer break, he and the New Warriors participate in a reality TV show. Nova and his teammates cross the American Midwest searching for super-villains. The show becomes only a mid-season replacement and production is shut down. The New Warriors TV show gets renewed at the last minute but Nova is called to Xandar before production resumes for the second season. At Xandar, Nova faces the Annihilation Wave led by Annihilus. Xandar is destroyed and Rich Rider absorbs the entire Nova Force and the WorldMind into his body. Nova is trained to fight by Drax the Destroyer, forms and leads the United Front (a resistance group to Annihilus's invasion force). After seven months of fighting the Annihilation War, Nova has a final confrontation with Annihilus and kills him. About three months later, Rich Rider, still containing the entire Nova Force and the WorldMind, begins protecting the regions of space decimated by the war as the last remaining member of the Nova Corps. Shortly after he began his mission, Nova was infected by the Phalanx during their invasion of the Kree Empire. During this time, the WorldMind deputized a young Kree medic named Ko-Rel to become Nova001, the first of a new Nova Corps. She was later killed by Gamora. About a month later, due to the sacrifice of Warlock, Nova was cured of the transmode virus and aided in the defeat of the Phalanx. During the Skrull invasion of Earth, Nova discovers the WorldMind has been creating a new Nova Corps without his knowledge. The new Corps includes Rich's brother Robert. After fighting in the Kree/Inhumans War, Rich decided to keep a handful of the recruits as the new Nova Corps. Approximately a year after the end of the Skrull Invasion, Nova discovered a lost Xandarian starship, the Resolute Duty, and it's sole surviving crewman Centurion Zan Philo. The WorldMind and the new Corps took up residence in the ship and began exploring the rip in time/space known as the Fault. Shortly afterwards, Richard Rider was invited to join the Secret Avengers by Steve Rogers. After a couple of missions, Nova became involved in the war to stop an invasion from the Cancerverse through the Fault. To stop Thanos from escaping the collapsing Cancerverse, Peter and Rich decide to trap themselves inside the other universe. Soon afterwards, Rich Rider uses the combined power of the entire Nova Force and the Cosmic Cube to open a doorway to his universe to save Peter Quill and Drax. While the door is open, the WorldMind reactivates and transfers itself back to Rich's body. Rich closes the door to seal off the portal between the universes and is trapped inside the Cancerverse. Around three months after Richard Rider's disappearance in the Cancerverse, 14 year old Sam Alexander finds his father Jesse Alexander's Black Nova helmet. For the next year and nine months, Sam fights numerous threats solo, with the New Warriors and as a member of the All-New, All-Different Avengers. He later splits from the Avengers to help form a new team called the Champions. 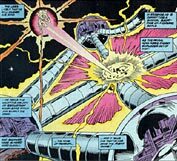 While trying to discover how the Nova Force works, Sam Alexander discovers the WorldMind in a pocket dimension (most likely the doorway interface with the Cancerverse created at some point after Rich Rider's escape). Sam meets the WorldMind's avatar of Richard Rider. After being trapped for two years in the Cancerverse in a cycle of constantly fighting, dying and being brought back to life, Rich Rider desperately transfers the entire Nova Force and the WorldMind into the drained Cosmic Cube and returns home. Sam and Rich meet and quickly form a student/mentor relationship as they fought the now-corrupted WorldMind's invasion from the Cancerverse. Afterwards, Rich returned to space and Sam continued with the Champions on Earth. A new Nova Corps formed using a prototype helmet created by Robert Rider and upgraded by Sam's helmet stolen by Corps leader Scott Adsit. The Man Called Nova #6 - The Condor's computers display an analysis of Nova which includes the fact that Rich Rider is 17. The Man Called Nova #14 & #15 - In both issues, Rich states that he is 17. In Rom #24 and What If #36 (the in-continuity pages), it's stated more than once that Rich has been gone about a year in space fighting the Skrull/Xandar War. In Nova #1 v2, the Shi'Ar slightly contradict this by stating that Rich was gone over a year. They also mention that Rich spent the next two years powerless. In the same issue, the Shi'Ar also mention that it has been 16 months since Nova's powers were reactivated by Night Thrasher. At the end of the same issue, Rich Rider turns 21 and his friends celebrate his birthday with him. The times given by the Shi'Ar are slightly off (if you strictly use their times, Rich would have missed his 21st birthday by at least 4 months). The discrepancies can be explained by the conversion of Shi'Ar time to Earth time. Their statements are all in years except the 16 months which they state as 'lunar cycles'. If we go with the What If statements (which come from Rich himself) as the true timeline, then the Shi'Ar are off on the plus side. That would make their second statement about Rich being powerless for two years off on the plus side, too. Their only other time marker was the 16 'lunar cycles'. Since that would be a general astronomical measurement and not a conversion from Shi'Ar time to Earth time, it could be considered an accurate time marker. The jump to Rich being 23 is from a couple of sources and I'll admit they are guesses on my part. In an interview I did with Zeb Wells, he thought a 'couple of years' had passed from the end of NW v2 until the Limited Series. Since Zeb wasn't quite sure of an exact time, I went with two years. In Marvel Team-Up 11, Rich tells Spider-Man that he'll be finished with college soon. Obviously, soon is subjective but it does mean that he's into college to some degree. Given that he's a film major, which is a four year degree, I decided to split the difference and guessed that he's been in college at least two years. He started college in Nova: The Human Rocket #1 which was also the time the NW v2 ran. That would make Wells 'couple of years' comment close since in MTU 11, Nova also mentions that the NW were going to be reformed (for the LS). The Annihilation mini-series provided a running count of days that had elapsed during the Annihilation War. It states that Nova killed Annihilus on Day 222 of the war. Since Nova didn't join the war until Day 7, I concluded that Rich himself fought for seven months. Annihilation Saga mentions that the entire Annihilation Event (the war plus the aftermath) ran 281 days and that Nova #1 (2007) began weeks after the event. I went conservative on the definition of 'weeks' and went with two. This gave a total of approximately ten months from the beginning of the Annihilation War to the events of Nova #1 (2007). In Annihilation: Conquest #6, it's mentioned that the Phalanx invasion took place over the span of nearly a month. Guardians of the Galaxy #1 takes place approximately two weeks after the defeat of the Phalanx. Nova #31 v4 notes that the end of the Skrull Invasion was "Last Year". While that could mean anything up to twelve months before the events in the issue, it was easiest to go the full year as no other time markers are mentioned from Nova #19 to #31. In The Thanos Imperative #1, the flashback sequence notes that the Annihilation War was two years before the current events in the title. Sam Alexander became Nova shortly after the disappearance of Richard Rider. Nova #6 v5, Sam's mom Eva mentions that Sam is 14 years old. According to Nova #1 v5, Sam became Nova six months before the events of #6. Later in the series, Sam is repeatedly mentioned to be 15 years old so his birthday occurred at some point. During the two Nova series featuring Sam as Nova, he went through two school summer vacations. Soon after he became Nova, he finished the school year in Nova #29 v5. In Nova #10 v6, he finished the next year and began the next summer break. In Nova #2 v7, school is once again in session. Adding in the six months he was Nova during the school year and the three summer months prior to v7, that would put his time as Nova during the two series at roughly just over a year and nine months. In Nova #4 v7, Gamora tells Rich Rider that he was gone for years after Peter and Drax came back. I decided to go with the lowest number possible and chose two. Also, in Nova #6 v7, the WorldMind claims that it and Rich were trapped in the Cancerverse for years. As the WorldMind was not with Rich Rider when the Cancerverse doorway was originally closed, I'm going with the assumption that the WorldMind reactivated from its dormant state (mentioned in Thanos Imperative #6) and downloaded itself back into Rich Rider when he opened the doorway in Guardians of the Galaxy #20 v3. I'd like to thank my good friend, Corey Blake, for his help with the issue charts. His amazing New Warriors Continuity Conundrum website was an invaluable help in cross-referencing (and accuracy-checking) the lists. The Timeline/Chronology is not an official documentation recognized by Marvel.